Building your own Deep Learning Computer only takes a few hours. Assembly video is below. You already know that building your own Deep Learning Computer is 10x cheaper than using AWS. But picking the right parts is not trivial, so let’s take a detailed look at things you should consider, the pros and cons of my build, assembly instructions, and how you’re saving thousands as compared to buying. This is part 2 of 3 in the Deep Learning Computer Series. Part 1 is ‘Why building is 10x cheaper than AWS’ and Part 3 is ‘How to benchmark performance’. See new photos and updates: Follow me on Medium, Instagram, and Twitter! Leave thoughts and questions in comments below. Picking the 4 most important parts: CPU, GPU, Storage and Memory. It’s hard to know how many GPUs you’ll need because some models take 10s of hours to train (Vision CNNs, Natural Language Processing LSTMs, etc). So, one best ideas is to start with 1 or 2 GPUs and add more GPUs as you go along. Each GPU requires at least 8x PCIe lanes (it’s 16x officially, but there’s data for which 8x is good enough if you’re not running cross-GPU experiments). You will need 4x PCIe lanes for the M.2 SSD (which plugs right in and is 5x faster than SATA3), and another 4x PCIe lanes for Gigabit ethernet. That’s a total of 40 PCIe lanes and will restrict your CPU choices quite a bit. Your CPU will dictate the motherboard you need. (For example: AMD Threadripper CPU = X399 chipset motherboard, Intel 7900X CPU = X299 chipset motherboard, etc). You’ll want a CPU with 8+ cores / 16+ threads and 40+ PCIe lanes since this allows 4 experiments per GPU if you have 4 GPUs. Typically models take up at least a couple gigabytes of GPU memory so it’s rare you can run more than 4 experiments per GPU. Also make sure the PCIe lanes are actually getting routed to the expansion slots. GPU memory works differently than computer RAM, so if you don’t have enough memory to fit your model you won’t be able to train (as opposed to train slowly). Once in a while I have a model that requires 10GB+ to run, so if in doubt, choose one with more memory. Speed performance is pretty linear as you add CUDA cores so expect 1080 Ti to be ~40% faster than 1080 and 1080 to be 33% faster than 1070. 2080 Ti is about 35% faster than 1080 Ti on 32 bit training and 80% faster when used in half precision mode because of the additional Tensor Cores. Tim Dettmers also has a great post on picking GPUs. Because you’ll be moving lots of data around from storage to memory then to the GPUs, you want that pipeline to be as fast as possible. Use M.2 SSD NVMe, which plugs right into the motherboard and DDR4 memory. 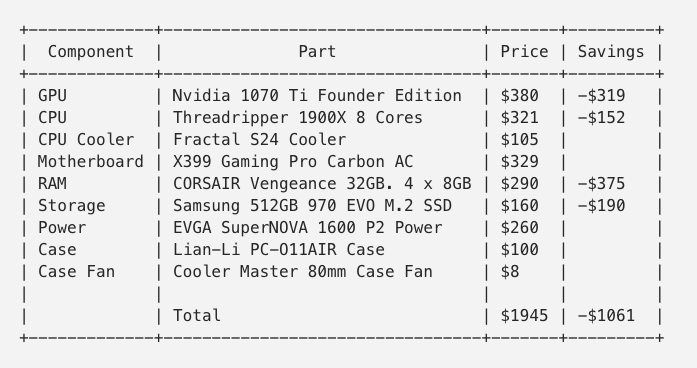 Here is my parts list with updated pricing and inventory. GPU: I picked the 1080 Ti because a 40% speed gain versus 1080 is significant when you’re talking about 10-hour train times, and the extra 3GB of memory is important when working with large models or increasing training speed with larger batch sizes. I later added a 2080 Ti, but given it’s almost twice as expensive but only offers 35% speedup in FP32 mode (80% speedup in FP16), it’s questionable value. CPU: AMD’s 1920X has 12 cores and 38MB cache and is $150 more expensive vs. 1900X’s 8 cores and 20 MB cache. Earmarking 2 cores / 4 threads per GPU and the fact I might want the machine to double as a staging server later, 1920X gives me a little more breathing room. Storage: I used a single 1TB M.2 SSD, I don’t like having stuff on different drives and 500GB seems small considering datasets are often tens of gigabytes. I might add a super large spinning hard drive for ‘cold’ storage later. Memory: Quad channel memory is used because 1920X runs faster with quad than dual channel memory. 4 x 16GB is chosen because maximum supported memory is 128GB so it’s an easy upgrade path without needing to remove chips later. Since datasets are sometimes 10GB+ compressed and you may want to use variations of datasets for different experiments, 32GB seems too little. 3000Mhz is the fastest memory compatible with the motherboard (it’s overclocked from base 2667Mhz). Power Supply: 1600W P2 is enough to cover 4x250W GPUs + 180W CPU + 150W for everything else and a little bit of headroom for overclocking. You don’t want to max out your power supply because fans kick in like crazy when it’s running at high utilization. Case: Lian-Li PC-O11AIR because I need a case with 8 expansion slots (most mid-tower cases have 7, which means you cannot get 4 double-wide GPUs). Between this case and the Corsair Air, this case looks nicer and comes with dust filters. 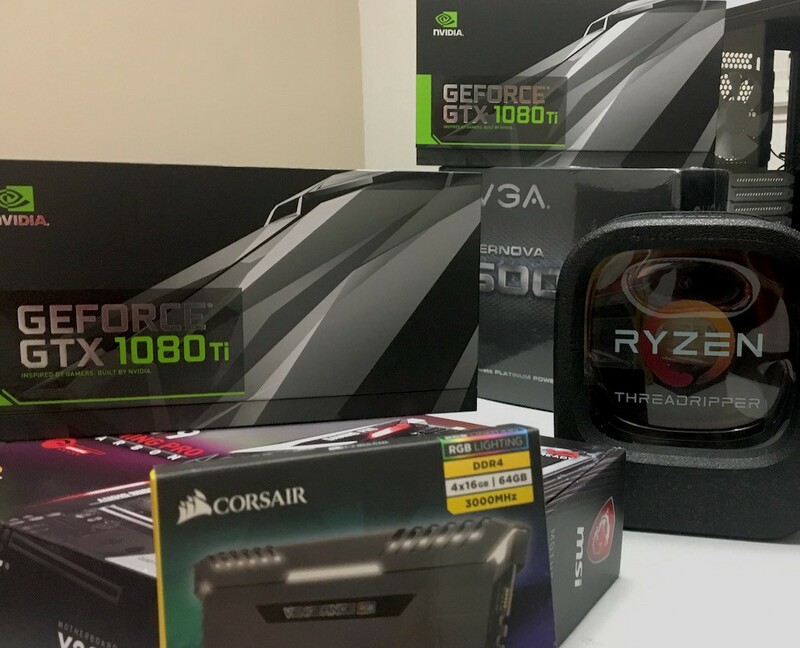 Run through this list to make sure your build checks out. GPUs overheat my computer: Make sure you get the blower-style Founder Edition GPUs (2080 Ti is called Turbo by Asus) because they vent out the back of the case. The ‘gaming’ ‘OC’ type cards will have 2 large fans that blow into the computer, which will overheat. You also need a fan that delivers cold air directly onto the GPUs’ intake. If there’s anything blocking the fan (like a radiator), the fan would not work as well. Not enough PCIe lanes: You need at least 8x PCIe lanes / GPU (16x is better). If you have 4 GPUs, with a M.2 drive and Gigabyte ethernet, it’s 40 PCIe lanes at a minimum. My model doesn’t fit in my GPU memory: large Convolutional Networks and LSTMs use a lot of GPU memory, 8GB vs. 11GB is a big difference. Motherboard doesn’t fit 4 GPUs: Your motherboard needs to have slots for up to 4 GPUs and they must have space between them to use all 4. Best way is to check is a visual inspection on Google Images or search for people who have done it. Case doesn’t fit 4 GPUs: most mid tower-cases only have 7 expansion slots, so you will not be able to put a 4th double-wide GPU in the bottom slot. I’ve only found Lian Li and Corsair as options. Power Supply doesn’t have enough power / is too loud: You need to account for GPU (~250W each), CPU (~180W), Other (~150W, Motherboard, fans, etc). Overclocking draws a lot of power as well. Some power supplies are loud, read reviews online for quietness info. Typically the 80+ Platinum Rated are quieter. My CPU cooler blocks the first GPU slot: Big air coolers such as Noctua sometimes will block the first GPU slot. Search for others who have used the combo. Knowing all this, you can see how the following is a budget expandable Deep Learning Computer that costs $2k and is also expandable to 4 GPUs. Budget computer before taxes, it’s still expandable to 4 GPUs. If you are considering buying a system instead of building one, you can get a 4 x 1080 Ti system from Lambda Labs for $9,200. 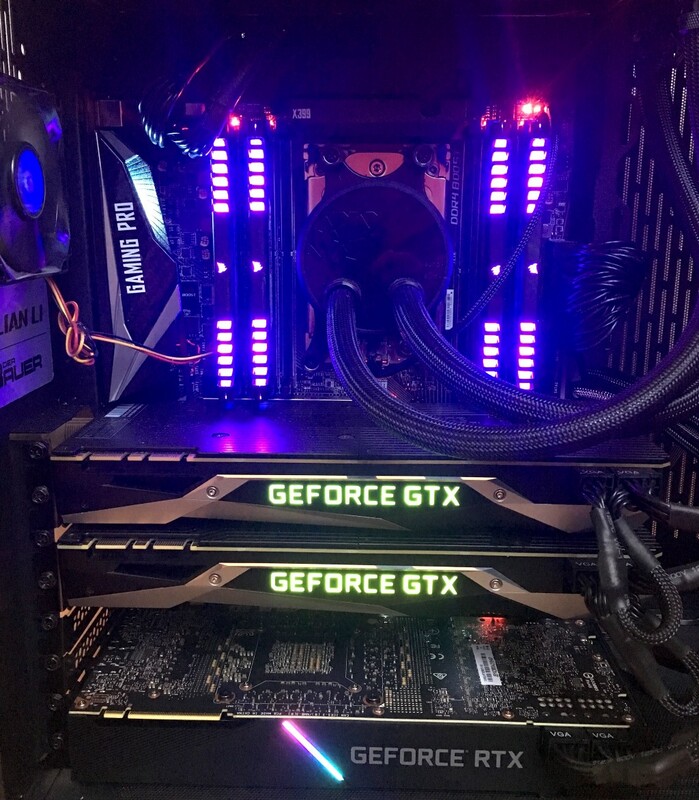 Building your own 4 GPU system is a total of $3,000 + $2,100 = $5,100. So that’s $4,000 (~45%) back in your pocket. 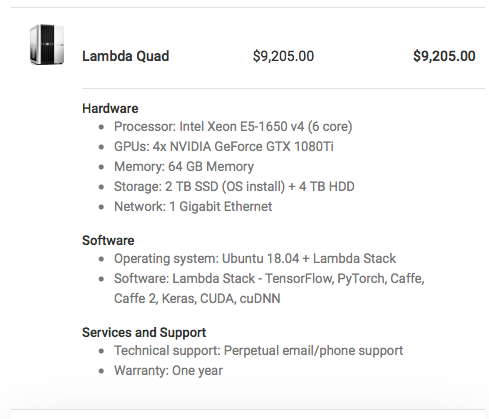 Lambda uses SSDs instead of M.2 and throws in a 4 TB HDD ($100). This is more of a development flow consideration because you will have to wait many minutes to load data before your model starts to train — so you just have to sit around and wait for it. SSDs will also slowdown everything else in your machine, such as boot. The CPU used only has 6 Cores, which is fine if you are running 1 experiment per GPU. When you start to run multiple experiments on each GPU, you will likely be CPU bound. PCPartPicker is very useful because it lets you select parts and tells you if there are incompatibilities, it also gives you the best price across several reputable sellers. Bandh, Adorama, Newegg, and Amazon are all reputable resellers. If in doubt, check Reseller Ratings. Assembly breaks down into the following 4 steps, and here is a short video of me assembling my computer. Case prep and install power supply. Motherboard prep: install SSD, CPU. Mount motherboard, CPU cooler, and fans. Connect cables. Install Memory, GPU, cable management, wrap up. I also watched this build video for X399/Threadripper, you can probably find a similar video for your parts list. If you follow tutorials, it’s relatively easy to get the stack up. If you don’t use tutorials or the wrong one, then it will be very frustrating! I installed Ubuntu 16.04 and used this tutorial for the CUDA/CuDNN/Tensorflow install. I think there’s a prebuilt for Tensorflow now so you don’t have to compile it from scratch. I added a 2080 Ti and another 1080 Ti and it was really straight forward. You will have to upgrade your Nvidia driver to nvidia-410 to run the 2080 Ti. In the next post I will discuss how to run basic benchmarks on your Deep Learning Computer and also show how fast my own models train on the cloud vs. on this computer. See new photos and updates: Follow me on Medium, Instagram and Twitter! Why is expandability important in a Deep Learning Computer? If you don’t know how much GPU power you’ll need, the best idea is to build a computer for Deep Learning with 1 GPU and add more GPUs as you go along. Will you help me build one? Happy to help with questions via comments / email. I also run the www.HomebrewAIClub.com, some of our members may be interested in helping. What models can I train? You can train any model provided you have data, GPUs are most useful for Deep Neural Nets such as CNNs, RNNs, LSTMs, GANs. Some examples w/ code & datasets are listed on my website thisisjeffchen.com. More FAQ: is located at the bottom of the page here. 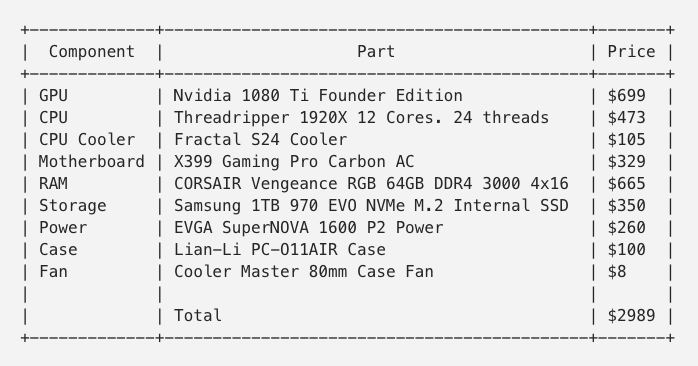 I got a lot of help from other articles while researching the build, if you’re interested in reading further I’ve listed them here: Michael Reibel Boesen’s post, Gokkulnath T S’s post, Yusaku Sako’s post, Tim Dettmer’s blog, Vincent Chu’s post, Puget System’s PCIe 16x vs. 8x post, QuantStart’s rent vs. buy analysis, Tom’s Hardware’s article. Thank you to my friends Evan Darke, Eva Glasrud, James Zhang, and Jodan Sill for reading drafts of this. How to build the perfect Deep Learning Computer and save thousands of dollars was originally published in The Mission on Medium, where people are continuing the conversation by highlighting and responding to this story.